Anti-Brexit dog owners will take their dogs on a march to parliament on Sunday to call for a second vote on EU membership. 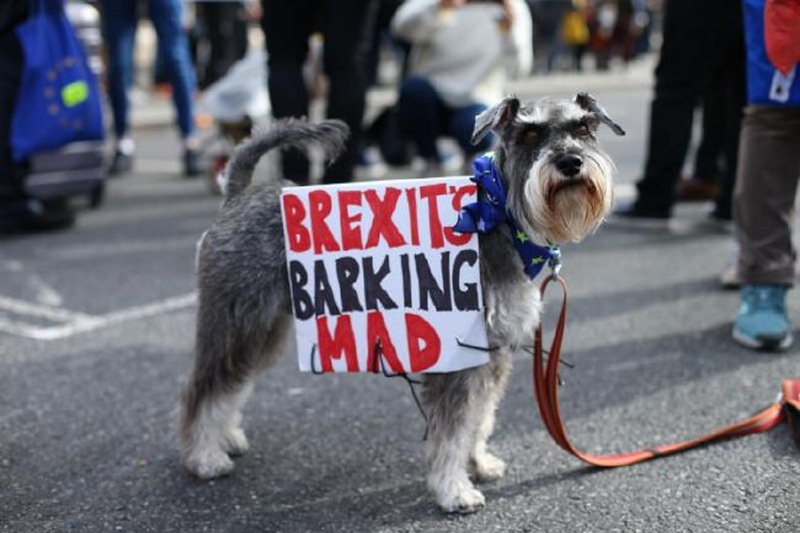 Participants in the campaign, who expect thousands of protesters and dogs to join the rally, say leaving the bloc will harm the estimated 54 million pets in the United Kingdom. They fear that this means a shortage of qualified veterinarians and veterinary nurses, which will raise the high costs for animal health products and even supplies running low. According to the organizers of the “wooferendum” march more than half of vets registering in the United Kingdom each year come from abroad, mostly European Union, citing a report from the Royal College of Veterinary Surgeons (RCVS) that says a cut in numbers would be likely to cause shortages, jeopardizing pet well-being and economic production. The college warned that approximately nine out of ten veterinarians working in public health roles, like abattoirs, come from other EU countries and, therefore, production could be affected. Veterinary leaders have called for Brexit negotiations to ensure there are no restrictions on the freedom of movement of EU-qualified veterinarians and veterinary nurses or on access to evidence that may threatens the UK's animal welfare research. Surveys have found a higher proportion of EU-trained veterinarians in the UK working full-time than average among those in the profession. The campaigners also point out that the National Office of Animal Health has said that a no-deal Brexit could mean shortages of about 40 percent of pet’s health products such as painkillers, vaccines, shortage of up to 40 percent of animal health products, such as vaccines, painkillers, antibiotics, and wormers, and buyers having to pay more.